Well, there's nothing bad, poor or ugly to say about this film. One great caveat, however, and it's a whopper: "perfect" for Love & Mercy means that co-writers Oren Moverman and Michael Lerner and director Bill Pohlad and actors Paul Dano, John Cusack, Elisabeth Banks and Paul Giamatti have so hauntingly, so desperately, so claustrophobically, so suffocatingly, so effectively, so thoroughly captured mental illness, the trauma of childhood abuse, parental overbearing and power and control and psyche-damage, and drug abuse and misuse that, midway through the film, you'll be ready for the sun, fun, surf and sand that The Beach Boys praised and promised. I never shuddered, I never cried, but I did endure what felt like nearly two hours of bricks resting on my chest. The music, of course, is melodious, harmonic and rapturous. The session scenes are neat and fascinating. The cinematography is blue, gray and gorgeous. The romance, the literal saving of a life (and the unique life at that) is really, really beautiful and ultimately heartening and inspirational. But the darkness and heaviness we must endure, the toes we stub on our way to find the light, they are bearable, but barely so for a June flick. If you are eating, you will eventually put your popcorn down. It is unhelpful and misleading to say, "I enjoyed this film" because, if you have a heart, you will not, as I did not. "Enjoy" is not the right verb. "Appreciate" or "admire" circle nearer to the sensation. 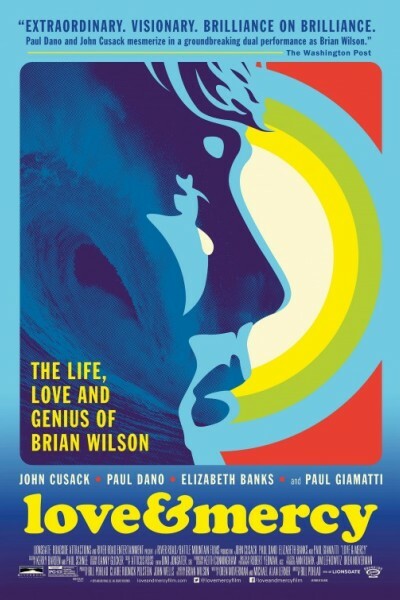 But Love & Mercy is fully and faithfully executed and, so well realized, that I now understand Brian Wilson a little bit better, and all the more empathetically, for sure. p.s. It is not "unsuitable" for older teens, but again; weighty, mildly intense, and includes era and pharmaceutical drug use.